Fellow Australian Marketer Kyle Tully is back for another interview. Kyle and I have been discussing internet marketing for a few years because we share the same views on most topics. This time we talk about offline business consulting and who is qualified to do this model. Both of us have been pursuing this lucrative internet marketing business model for several years. Kyle got into marketing at an early age. He came through the traditional Dan Kennedy style of direct response marketing. This is the same sort of material I would recommend all serious marketers get access to. I own every one of Dan Kennedy’s NO B.S books. Do offline business internet marketers need to be technical? We discuss technical versus marketing skills. Putting together a business is going to involve some basic technical learning. If you can learn these things even a little you can put your self into a position where you can outsource later anyway. When you outsource the technical stuff you can know what to expect from outsourcing and you can fix things on the spot if you have to. Being able to talk about these things confidently will give you a boost when it comes to talking to offline clients. Professional web clients (corporates) will happily pay you to make small changes. You can outsource this and charge the client. We discussed the ‘done for you’ with a maintenance service model. Kyle says clients want this and I agree. One time fee or recurring income? Typical services clients of Kyle will learn are how to sell packages of websites, traffic, SEO (Search Engine Optimization, newsletters, article writing, PPC (Pay Per Click) , followup marketing with auto-responders. You can work within your strengths and clients will happily pay you to learn on the job. Once you learn a skill for a client you can use it for other clients and your own business. Just do it for yourself or do it for others? Kyle and I discussed the dream goal of sitting at the beach making money. (Ironic given that I am typing this from the beach house!). We agreed that providing a service for others is a great way to start cash flow and get great experience. We both still serve clients through services and personal content because we can hone our skills. Kyle gets a lot of enjoyment from helping business owners. The average business owner has a very low level of knowledge about Internet Marketing. Even with a small exposure to internet marketing and solid offline consulting strategies you will be able to impress. Some of Kyles students have started out with a good mindset and created a very good business within a short period of time. One of my own Business Internet Formula students (Jock Purtle) pursuing this model generated a six figure contract within a few weeks! We both have seen people do this fast when they apply the methods we teach. 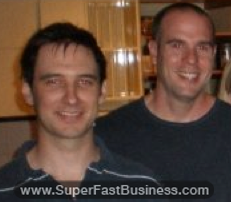 I have some templates in my SuperFastBusiness forum and Kyle has massive content in his membership. Kyle and I have seen a lot of trashy products coming out in this niche (the ‘offline gold local business’ niche). Many of these were put together by students in dorm rooms with nothing but a taste for opportunity. For example any product that puts a heavy bias on cold calling is missing the point. Many traditional internet marketing experts have cobbled together products (often with a no-name business partner) to serve this hot niche. What you should be looking for is a solid business plan that involves creating a ‘pull marketing’ system (where the client will come to you). You should look for better ways to have clients come to you and they should also be keen to buy from you. Kyle invested over $50,000 in educating himself and formulated direct mail templates that he has included in the membership site that he runs. He has been selling these services to corporates as I have for years. Real experience in the market is irreplaceable when you are looking for someone to model from. When asked for advice Kyle suggested people take action and just get started. Start telling people that you are in the business and get going with it. One of the biggest things that is separating Kyles membership from the rest of the products out there is Kyles special Licensing information. I truly believe that Kyle is at the top of the game and he has produced more winners than any other offline community I have seen. You may also visit our iTunes channel to listen to our podcasts.